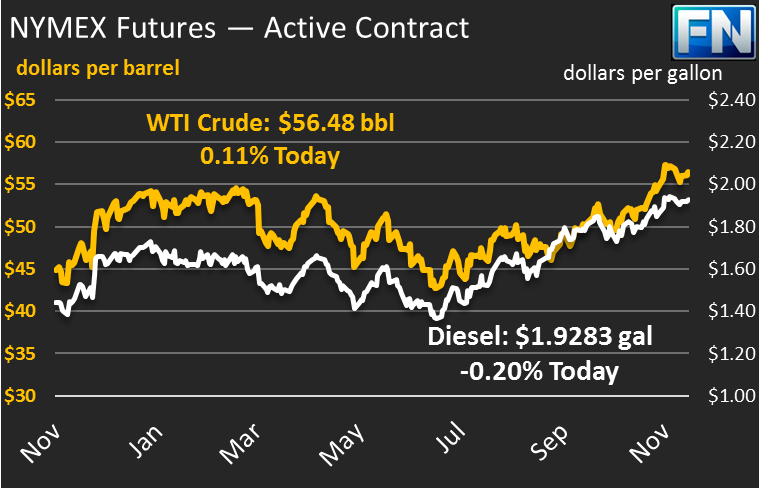 After moderate losses yesterday, oil markets are heading towards higher ground. Oil prices yesterday gave up 60 cents, a notable -1%, as the December contract expired, showing that markets lack confidence in physical supply tightness next month. 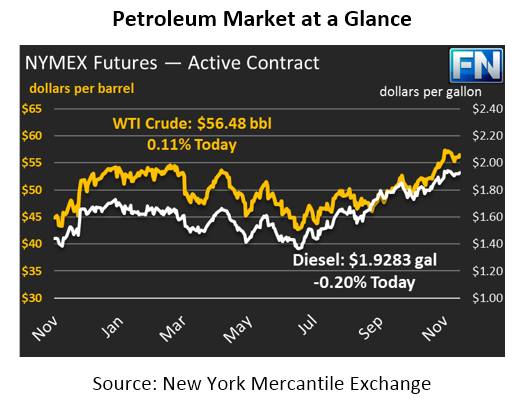 The contract now rolls over to January, which traded 33 cents higher at last night’s close. Prices are flat this morning, with crude gaining just 6 cents over yesterday’s January closing price and trading at $56.48 . Refined products are mixed this morning after small losses yesterday. Diesel prices gave up 1.5 cents (-0.8%) yesterday in response to lower crude prices, while gasoline shed a lightly 0.2 cents (-0.1%). Today, prices are continuing their losses, with diesel prices down 0.4 cents (-0.2%) to $1.9283. Unlike diesel prices, gasoline prices are on the uptick this morning, picking up 0.9 cents (0.5%) to trade at 1.7524. The main headline yesterday was that the Keystone XL pipeline was officially approved by Nebraska, paving the way for the pipeline to continue. This comes just days after the original Keystone Pipeline leaked 210,000 gallons of crude oil in South Dakota. Keystone XL has been a very controversial piece of legislation, and this approval brings TransCanada one step closer to being built. Nebraska’s approval came with some changes in the pipeline’s path, meaning that a few more counties will need to approve it. Pipeline economics and lawsuits from opponents could still create more delays for the pipeline, which would ship 830 kbpd of oil from Canada to Steele City, Nebraska. In international news, Iraqi exports hit a record high in November, rising 150 kbpd so far this month to reach 3.5 mmbpd. The news came along with official data reporting Saudi Arabia exports fell to 6-year lows in September. Saudi Arabia has gone above and beyond their OPEC deal commitments, pledging to bring markets into balance. Overall deal compliance has hovered in the 80-90% range, which is quite high for an organization known for cheating on deals. Markets continue watching to see whether the deal will be extended beyond March 2018 – growing opposition from Russia threatens to unravel the deal, but markets are still showing near-record length as investors bet on an extension.